Shri Sridhar. Hats off to you. Good that you have thought about this. By this, many deserving cricketers (read yesteryear) can be brought to limelight. As for the Opening Hero of this thread is concerned, what should I tell? He is one person who made adrenaline flow in the veins of even spectators. Most of the people talk about only the 175* and World Cup triumph. There is more to Kapil. The things that immediately come to my mind are his exploits in Pakistan in the debut series (1978) and in England (1979). His bowling in the 1981 Melbourne test to skittle out the Aussies for 81, inspite of having high fever, his 9 - 83 in Ahemedabad in 1983 against the Windies, his whirlwind knock in the Tied Test in 1986, his four sixes in 4 consecutive balls to avoid the follow on against England, and many more exploits of his. Thanks and hope to see more of this kind. I started following cricket only from India's tour of Australia 91-92. 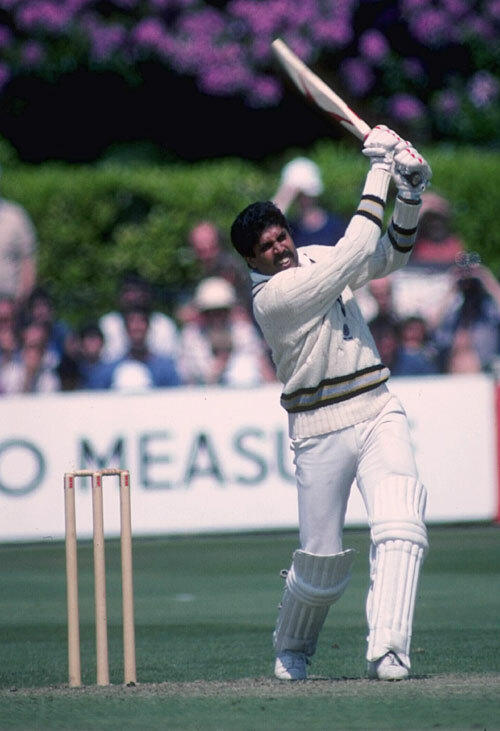 One of the earliest cricketing memories I have is of Kapil Dev picking up Mark Taylor lbw as his 400th wicket. Kapil reaching 5000 runs against England (I think in Chennai) - and Gavaskar commenting that if this man had concentrated on his batting he would have reached 10,000. And of course when he equalled and broke Hadlee's record against Srilanka at home. One other inoccuous memory that is lodged is Kapil picking up the wicket of Jimmy Cook in the first ball of the first ever test series in SAfrica. While I wouldn't claim to have seen Kapil at his best there is one memorable match in that series I would like to recall. After managing to draw the first two tests we got beaten in the third test. After conceding a lead we go into the second innings around tea on Day 3. We are down to 31/6 !!!! Courtesy Alan Donald and Brett Schultz. I heard the 31/6 on news and was shocked ! Checking the scorecard I see that we were 17/5 and then 31/6. The 6th wicket was Pravin Amre, the overrated hero of the previous test got out to a shot that was so grossly irresponsible given the scenario that even Sehwag would not play it. From there Kapil took over. He built partnerships with the tail and took us to a respectable score of 215. Just look at his innings. 129 (180) 14X4 and 1X6. It doesn't betray the kind of pressure he was in. And mind you Alan Donald was breathing fire. He picked up 7 wickets, including eventually Kapil , taking his match haul to 12 (which was his personal best for a long time). We got trampled in the second innings and SA reached a well deserving victory. But that one innings by Kapil made the whole thing so memorable. Heroic, no other words for it. Prevented us from an innings defeat to a country which was just returning to Test match cricket and was - for all practical purposes a newbie. There was no live telecast of those matches (DD used to telecast domestic tests live). Even the highlights would come in the next day night. Test matches used to have draw of stumps score-reports in the papers but you have to wait the whole day to watch the action on TV. It was worth the wait. Everyone talks about Atheron duellin with Donald to save the day. When rewatching this innings on TV a few years back I see this is an equally good innings and Donald was attacking quite fiercely. But Kapil just battled it out without getting defensive. I think even that lone six was off Donald !! Kapil btw was aming the first who hit Donald - who was a sensation when he made his debut- for a six : that was in the world cup 92 match. While I did not see his best, I could clearly see why my older cousins and uncles held Kapil in such high esteem. Kapil Dev, nicknamed, Haryana Hurricane was a phenomenon and a breath of fresh air in an era of spinners dominating the Indian Cricket scene. He was fast with a lethal outswinger and made people notice him instantly. Coming from a normal town with no back up and facilities to pamper him, Kapil rose on his own to become India's greatest Cricketer of his time. He is the first and one and only full fledged All Rounder that our Country could boast of and one who could change the context of the match with his bowling/batting as also fielding. He was always a livewire in every sense. The joy he gave to the public is enormous and people loved him for what he is. He could decimate the best of attacks on his day and make best of bestman look silly and also take stupendous catches. The innings of 175 n.o against Zimbabwae is rated as one of the finest innings of one dayers for his grit, determination and his style of hitting out of trouble. It is said a million times that the catch he took to dismiss Viv in World Cup was the turning point of the final. His 9/81 against West Indies in 1984(i beleive) is one of the finest expositions of fast bowling against mighty batting is one of the many such efforts. Even now, during the commemoration of the 25 years of World Cup win, he is so humble about his achievements and he thanks God for all. He is not only a finest cricketer but a great human being who did not know the nitty gritty politics of our cricket est. and was hounded out often for no fault of his. Kapil is a joy to behold and his mere prescence has attracted scores of people to the game and was proudly named the WISDEN CRICKETER OF THE CENTURY. As far as Indian Crikcet is concerned, Kapil is irreplaceable and one, who played with full commitment and prided himself in representing the Country. For Kapil, Country is above all and for cricket lovers, Kapil is above all. domestic cricket in SA is very good like in australia and intesity wise they are on par with test cricket. So, you can't call them a newbie. For ex, Michael Hussey made his test debut only recently but he is a veteran in their domestic cricket. No wonder he made a big impression in test cricket and is called Mr. Cricket. If you are talking about the test match in port elizabeth, Kapil hit a six of one criag mathews( i am sure its not Donald ) to the upper tier in the stands near the press box and later seems to have told that he didn't quite get the timing right. When eddie hemmings ( the same guy who tooks kapil's wicket in the world cup semifinal in 1987) bowled the over, kapil hit 4 consecutive sixes. Though, we avoided follow on, we lost the test match. scored a brilliant century in the first innings in the tied match against australia. Kapil took 5 wickets in the second innings to script a famous victory against australia in melboure in 1981. The match saw ugly spat between dennis lille and sunny and sunny almost walked off. The icing on the cake is the 1983 prudentail cup win and Kapil's innings of 175 not out against zimbabwe which was a world record score at that time. We won the 1985 champion of champions too with kapil playing along with vengsarkar played a memorable innings against the kiwis. We were undisputable kings of ODI from 1983 to 1987 till australia took over. We were the hot favourites to win the 1987 world cup and everyone was expecting a india - pakistan final in eden gardens. We were cruising along till england hit us in the semis in mumbai. pakistan too lost to australia. The legend has never missed a match due to fitness . To sum up, Kapil Dev is the greatest all rounder that India has ever seen. P.S. Opposition batsmen must've started wearing helmets against india only after Kapil Dev's debut. As far as we have known, personal life sees him as a very down to earth humble person. I stand corrected. I wasn't sure actually. bowled the over, kapil hit 4 consecutive sixes. Though, we avoided follow on, we lost the test match. That too we were 9 wickets down and we needed 24 to avoid a follow on and he hits 4 sixes to get there. That's as crazy as it gets !! And here's that famous catch...no words, just watch.